Walt Disney died on December 15th, 1966 and left behind a studio of talented people to carry on his legacy. However, it would take more than a year for audiences to stop seeing his direct influence. Monkeys, Go Home was the first film released after his death, but production had been fully wrapped before his death. It's based on a book called The Monkeys by G.K. Wilinson, and since monkeys were featured in Disney films almost as much as dogs its no wonder that it was selected for adaptation. And with Dean Jones quickly becoming the studios biggest star, Walt was looking for other projects for him. Andrew V. McLaglen was chosen to direct his only Disney film after much success directing for TV. Maurice Tombragel adapted the screenplay after writing a Disney film that featured a chimp called Moon Pilot. Maurice Chevalier costars with Dean Jones in his final film performance. He previously starred in In Search of the Castaways and had an album of Disney songs on Disneyland Records. French actress Yvette Mimieux stars as Jones' love interest. She would return to the studio years later in The Black Hole. The rest of the cast was filled with French actors who were flown to California for the shoot. Most of the film was shot at the Disney Studio and on location nearby. Many of the Zorro sets were redressed to be an Italian village. The Sherman Brothers wrote a song for the film called "Joie De Vivre." The film begins with footage of a car driving through the Italian countryside as the credits play. A man named Hank gets out of the car in the village to pick up the deed to an olive farm he inherited. Father Sylvain arrives to welcome him and tells him it will be impossible for him to harvest the olives himself without a large family. Father Sylvain sends a pretty girl named Maria to help Hank get settled, meanwhile he sends for four girl monkeys he worked with in the US Air Force. Maria helps Hank train them to pick olives. When a greedy man who wants Hank's land finds out, he convinces the village to protest against the monkeys, viewing them as a threat for their jobs. Hank brings the monkeys to the village and they melt the hearts of the locals, who give up their protest. However, he then finds out that the olive buyers won't buy olives picked by monkeys. To convince someone to buy his olives, he offers them rights to all of the olives in the village by having his monkeys pick the other farmer's olives free of charge. Maria falls for Hank who doesn't return the favor and they have a fight, just as a woman arrives claiming to be Hank's cousin and co-owner of the olive farm. Maria uses the monkeys to scare her away and Hank realizes he loves her. When the wind comes to blow the olives down, the town is overjoyed to have the help of Hank's monkeys. However, Maria buys a male monkey to add to the family and it distracts the girls, who stop picking olives and try to get his attention. Father Sylvain gives a speech to the village about helping your neighbors and the village helps hank pick the rest of the olives. The film ends with Hank proposing to Maria. 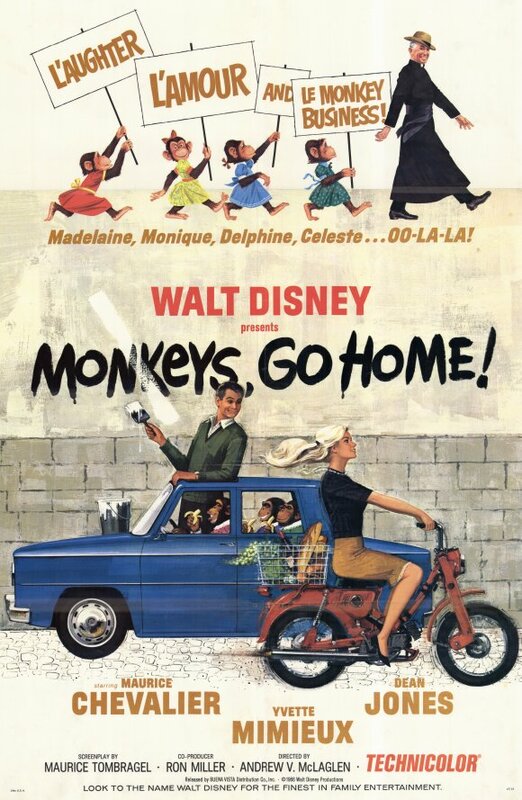 Monkeys, Go Home premiered on February 2nd, 1967 and was released on February 8th. Critics agreed that it was full of monkey humor, but claimed that viewers who don't enjoy monkey antics would find it unenjoyable. It didn't do well at the box office and premiered on The Wonderful World of Color in 1970. It was released on home video in 1987. Critics may have been too harsh on the film in 1967 because the monkeys don't receive as much screen time as they claimed. The film is really about Hank's struggles to succeed as an olive farmer. However, compared to other Dean Jones Disney comedies, it clearly isn't as good and it's easy to see why audiences weren't as receptive to it as The Ugly Dachshund. But if you enjoy Disney animal comedies, you will find yourself amused by Monkey's, Go Home. A field of olive trees were planted next to the animation building at the Walt Disney Studios, which remained there for years until a parking structure was built over the land. Monkeys, Go Home is currently available on DVD. The film is presented in fullscreen, although it was originally released in widescreen 1.75:1. A minor restoration has been done, but the picture does suffer from white artifacts. There aren't any bonus features. The film is available on iTunes in widescreen, where it is also available in HD. This film is unlikely to get another physical release on DVD or Blu-Ray, so this may be the only way to own the film in widescreen.